Eden Mills is a lovely and friendly community of fewer than 300 people, and is located along the Eramosa river between Guelph and Rockwood. Close to a variety of towns and cities, and surrounded by protected conservation areas, Eden Mills is an idylic location free from the threat of growth and well located close to all modern conveniences. Come and enjoy the surrounding countryside for a leisurely walk, swim, coss-country ski in the winter and much more. With a long history and strong community, there is always something happening in the Village. Check the Eden Mills website for details, and local event information. We are also very proud to be participating in the Carbon Neutral Project, where Eden Mills aims to be the first village in North America to become carbon neutral. This grand initiative has included such projects as the introduction of solar energy, wind power, and community farming projects to the village. Visit the website for more information about how Eden Mills is going carbon neutral. Eden Mills is also the home of the well-known Eden Mills Writers' Festival. This is an annual weekend event in September where the village is full of writers, story-tellers and book lovers. The weekend is filled with readings and children's activities and book sellers line the streets. Local food vendors set up tents and sell great food, allowing visitors to enjoy a meal or snack, and stay in the village all day. Check the Writers' Festival Website for dates, authors and events. The Barden of Eden is a great place to stay if you want to enjoy the peace and serenity of a small town and visit the City of Toronto during the day. A simple 1 hour drive will take you into the heart of Toronto where there are endless attractions to keep you engaged. Canada's famous landmark the CN Tower is located on Toronto's lakeshore with the hip Queen St to shop around the corner, and Chinatown down the street. The convenience of Toronto's TTC public transit will easily take you around the city from the Beaches, to the Distillery District and more. Visit Toronto's Visitors page for events and attractions and the City of Toronto page for more tourist attractions. Toronto Pearson International Airport is only 45 minutes from Eden Mills. Elora is a hidden gem here in Southern Ontario and makes a perfect day trip from The Barden of Eden. This lovely little village is a wonderful place to spend the day strolling along the mill stream, browsing the many Artists' studios, shops and Galleries on the waterfront. The Elora Gorge and Conservation Area, Elora Quarry and Elora Gorge trailway are great places to walk and hike, picnic, go fishing, swimming and kayaking with the family. Other attractions include the Elora Mill, Antique Market and The Elora Center of the Arts. You'll be able to stop for a cup of tea or a pub lunch at one of Elora's many fine eateries. Elora is a great place to spend the afternoon, and only 40 minutes by car from Eden Mills. Visit Elora's Homepage for more details. The town of Fergus is famous for its annual Fergus Scottish Festival & Highland Games, held every August. The annual Fergus Truck Show is held every July and is known across Ontario. Fergus is also a great place to spend the afternoon wandering around their many shops and tasting local delicacies. The Fergus Marketplace is a great historic space to wander around and has many retail shops and restaurants. Visit their information page for details. Guelph, our closest city, is convenient and full of local attractions. There you will find the historic downtown has many shops, Galleries, pubs and restaurants to visit. The Bookshelf plays excellent films and also has a bar and lounge, plus coffee shop, and bookshop to browse. Visit the Guelph Arts Council for more local art events, The Echo for concert listings and the Guelph Visitors Page for further details about what there is to do in the city. For information on Wellington County, visit their homepage for events, details and activities around Eden Mills. If you are visiting the University of Guelph, we are just a short 10 minute drive through the country away. The Barden of Eden is the perfect place to stay while taking a short course, visiting students, or for potential new students to get acquainted with the University. The town of Alton is another great day trip to take. Only 40 minutes by car takes you to the historic Alton Mill which makes a wonderful afternoon of shopping and browsing the Art Galleries, Fair Trade shops, and Studios. Have a cup of organic tea at the cafe and marvel at the everchanging outdoor sculpture gallery. Visit their website for details and upcoming events. Along the way to Alton, make a stop in the town of Erin. This small community has many lovely shops and restaurants to browse on their main street highlighted by many historic buildings. Click here for driving directions. The Mennonite community of St Jacob's which is popular among tourists and locals is only a short drive away. There you can experience the unique way of life of the people by tasting their delicious and wholesome meals at the restaurants and bakeries, shopping the Artisanal markets and visiting the craftsmen in their stores and workshops. A stone's throw from the box shopping malls of Waterloo, St Jacob's guides you back in time for a wonderfully relaxing afternoon. Visit their website for more details. Click here for driving directions. The spectacular Niagara Falls and Niagara wine region make a wonderful day trip year round. With gorgeous countryside and vineyards to visit during the summer months, no trip to Niagara is complete without a ride on the Maid of the Mist. In the winter, lights light up the falls in the evening as the mist freezes a layer of opulent beauty over the great cascading falls. Don't miss the Butterfly Park and many shops and boutiques in town. An easy 50 minute drive from Eden Mills, Niagara makes a for an eventful and fun day trip. The annual Stratford Festival on from April to October boasts an exceptional performance line-up. This internationally famous live theatre festival, which brings together incredible Canadian talent, is a little more than an hour away from Eden Mills. Driving Directions can be found by following this link. Visit the Festival Homepage for more details. 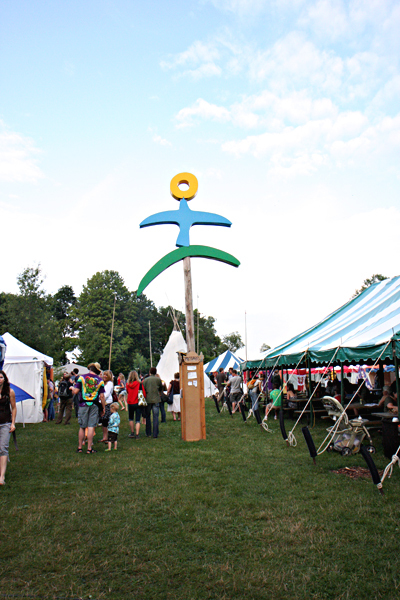 The Hillside Festival is an annual three day music festival that takes place just outside of Guelph at the Guelph Lake Conservation Area in July. Hillside is a popular weekend for many music fans country-wide. It features music by diverse Canadian bands and artists and offers something for everyone. Based on an eco-friendly foundation, the Hillside Festival boasts no disposable plates, or cups, free water to fill your cup or bottle and locally sourced foods. Vist their website for more details.